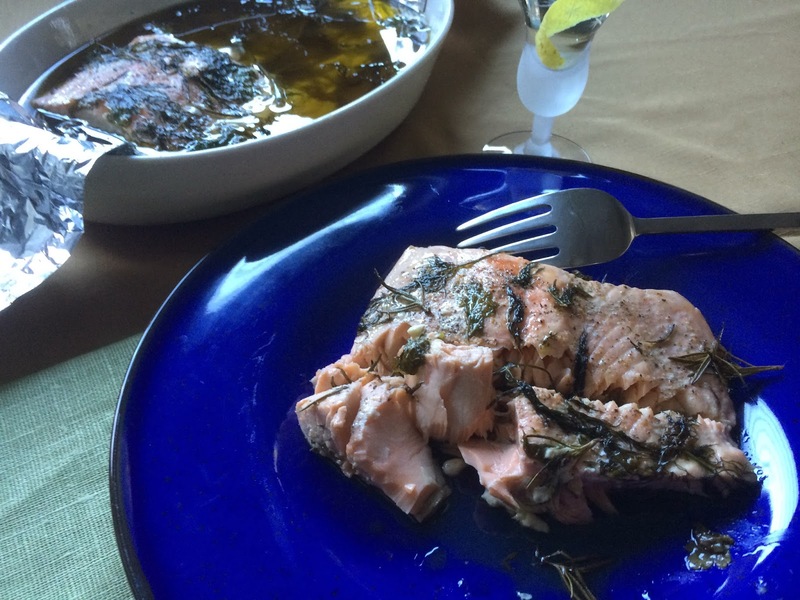 Andrew Schloss | Cookbook Author: Chanukah Chow: It's About the Oil, Stupid! Chanukah Chow: It's About the Oil, Stupid! There are two broad classifications of Jews, Ashkenazi and Sephardi, distinguished by the geography from which one's ancestors fled. Those kicked out of potato-eating eastern Europe are Ashkenazic and at Chanukah they dine on potato latkes by the dozen. Those that were made to feel unwelcome in Spain and its territories due to that nasty Inquisition are Sephardic, and, depending on where they landed, they eat some sort of deep-fried doughnut, known as loukomades to Greek Jews, zelebi to Persian Jews, and sufganiyot in Israel. Like the Maccabees before me I'm waging a revolution to draw all Jews under one universal culinary miracle - poaching in oil. Not only does the technique create unbelievably sumptuous results, but it yields a cache of buttery herb-scented oil that will enhance the seven subsequent days of your Chanukah feasting deliciously. Not unlike the original lamp oil that kicked off the whole shebang. 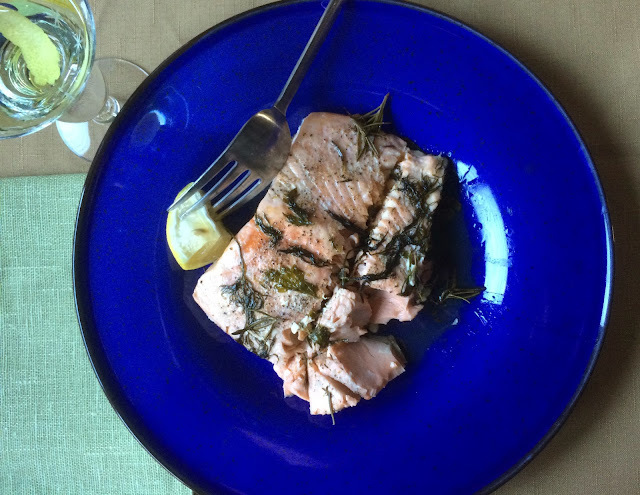 One of my favorite recipes in Cooking Slow is for Salmon Poached in Herbed Oil (page 163). As usual I have tripped over a few improvements since I wrote the original. For one I had written that you should heat the oil to 350°F before adding the fish, which is higher than it needs to be. Heating to a lower temperature, 300 to 325°F, preserves the fragrance of the oil and frizzles the herbs less. I had gone with 350°F on the printed page, because I wasn't sure you'd have a deep-frying thermometer, and most people would end up testing the temperature of the oil with a wooden spoon or chopstick. To do that you stick the wooden tool in the oil and if the oil is 350°F or hotter, water trapped in the wood fibers will steam and form visible bubbles. 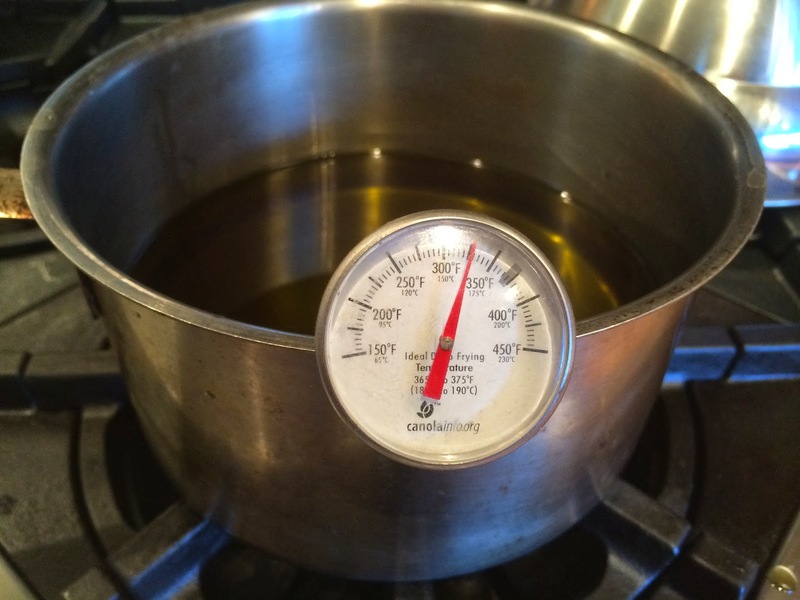 If you don't have the appropriate thermometer you'll still have to test the temperature of the oil that way. I made another change for photography. Aiming the camera into my black iron Dutch oven is like shooting in a coal mine. For purely visual reasons I switched to a white baking dish and I found the lower-sided baking pan made it way easier to handle the fish. You can use either one (or a fish poacher if you have one), but I've written the recipe below for a baking dish. Following the recipe are seven ideas for using the fragrant oil that is leftover after poaching the fish, making this the first Chanukah recipe that inspires enough cooking to last all eight days! 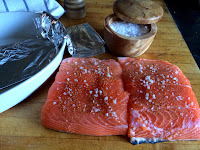 Sprinkle the flesh side of the salmon fillet liberally with salt. Wrap in plastic and refrigerate for at least 2 hours and for up to 12 hours. Preheat the oven to 170°F/77°C. Put the olive oil in a medium saucepan and warm over medium heat until the oil reaches 300 to 325°F/150 to 163°C on a deep-frying thermometer. While the oil is heating, remove the salmon from the refrigerator. Fold an 18 inch /45 cm length of foil in half lengthwise and lay across the bottom of a 2 qt / 2 l ceramic baking dish, draping the ends of the foil strip over the ends of the baking dish. 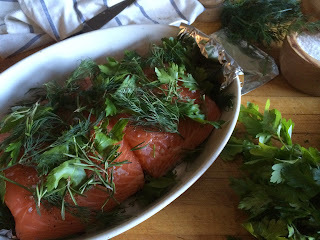 Scatter a small handful of the herbs over the bottom of the foil, and put the fish on the herbs, skin-side down. 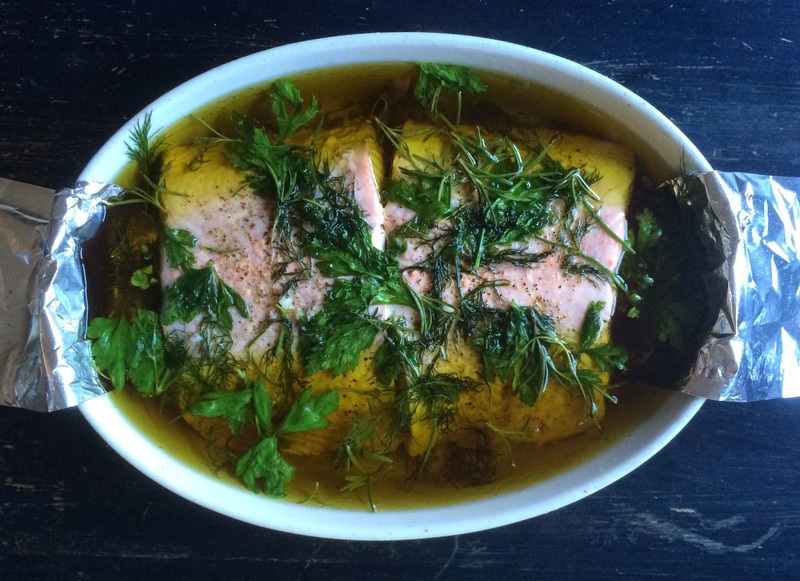 Scatter the remaining herbs on the flesh side of the fish and press lightly to help them adhere. When the oil is up to temperature, turn off the heat. 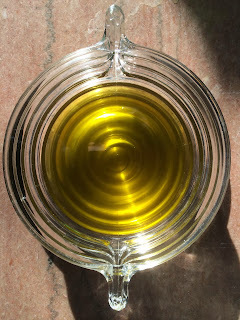 Using a ladle or a large kitchen spoon, spoon the oil over the fish. The herbs will steam and sizzle, and the surface of the fish will turn opaque pale pink. 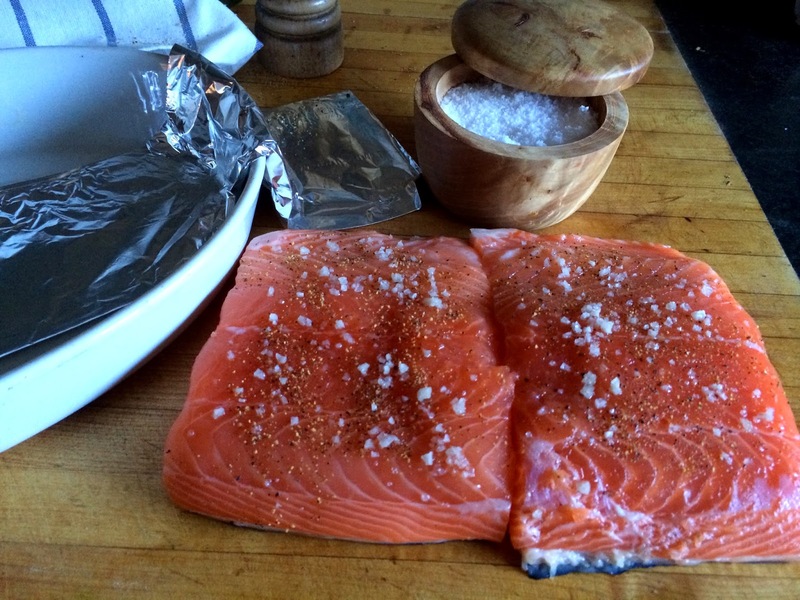 Cover the dish loosely with foil, transfer to the oven, and poach until the fish is firm to the touch, 3 to 5 hours. The oven temperature is low enough that you do not have to worry about overcooking. To serve, lift the fish, on its foil sling onto a sheet pan to catch any oil drips. 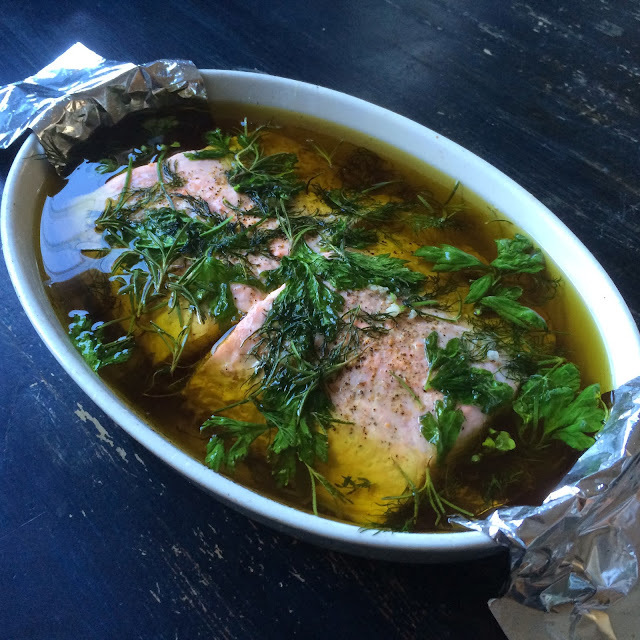 Slide the fish from the foil onto a serving platter and spoon some of the warm oil over top. Drizzle with the lemon juice and serve. Store: for up to 2 days, covered in the refrigerator. Bring to room temperature before serving. Fry your latkes in the reserved oil. Make mayonnaise by whisking 1/2 cup of the cooled reserved oil into a beaten egg yolk and the juice of 1/2 lemon. Whisk equal parts wine vinegar and reserved oil together for vinaigrette. Season with a split clove of garlic. Make a scramble of eggs, onion, and chopped smoked salmon using a tablespoon of reserved oil for cooking. Use reserved oil in your favorite marinade or stir fry. Toss the scented oil with hot pasta, some minced garlic, and grated cheese. Wake up in the middle of the night; slip the container of reserved oil from the refrigerator; warm for a few seconds over a low flame; tear off the end of the loaf of bread you purchased after work; dunk it in the fragrant oil bath; eat; swoon; go back to sleep. Wow, at first, I thought why so much oil? But once I read on, it started to make sense. I've never tried salmon before, but after reading this recipe, I'll surely be making this in the next few days. Thanks for the great recipe!